Happy Halloween Week! Are you ready for all the Trick or Treaters that will be coming to your door on Friday? It's so much fun to see them all dressed up in fabulous costumes! If you are looking for my current "White on White" HMFMC Challenge reminder post, click here or scroll down one post to go directlty there. To enter your projects into the Challenge, go to the main post for HMFMC181 found HERE. Are you looking to enter the chafor the HALLOWEEN BLOG CANDY? Click HERE to go directly there and enter for your chance to win it on Halloween. Stamps: Stampabilities, HMD, "Frightingly Adorable", HMPR1079. 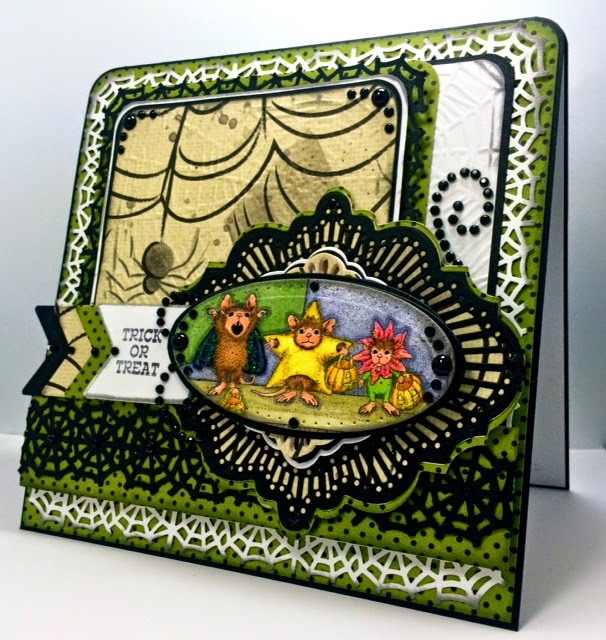 SCS -Sunday's SCS Featured Stamper, Annette, #FS403 challenge. This Months SCS Dirty Dozen Central Theme challenge #CT1014: Hopelessly Devoted. (My devotion is House-Mouse, Embossing Folders, Punches and Dies). and today's SCS Teapot Tuesday Challenge# MMTPT326 - "Pumpkins". (These little mice all have their little Pumpkins ready to fill with CANDY as they go out trick or treating... :) heh! Hope you can come and join us at HMFMC this week for the current "White on White" theme. We have some fabulous DT samples to help inspire you and some great prizes up for grabs. 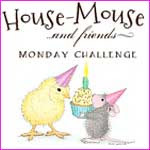 Make note that next week we are also running an incredible House-Mouse BLOG-HOP full of awesome GOODIES and inspiration. Be sure to stop by on November 3rd to join the FUN at HMFMC. What a beautiful Halloween creation, great color combo! Wow a unique take on All Hallows Eve, it's brilliant. That is an awesome card with awesome die cuts! Very cute! Thanks for joining us at Through the Craft Room Door Challenge!! Good luck and hope to see you next week, too! Love all the papers, those beautiful dies, and the adorable mice in their Halloween Costumes, America. What a perfect Halloween card. Thanks for joining our “Halloween” Challenge this week at Die Cuttin’ Divas. Fabulous and those are cute little mice! Your card is amazing. I love all of the layers and die cuts. The House Mouse image is perfect for this card. Thank you for joining us at Ike's World for our Trick or Treat Challenge.